The Telegraph cites a newly published study in the Journal of the American Medical Association suggesting that mindfulness may be a better treatment for chronic back pain than other ordinary exercises. 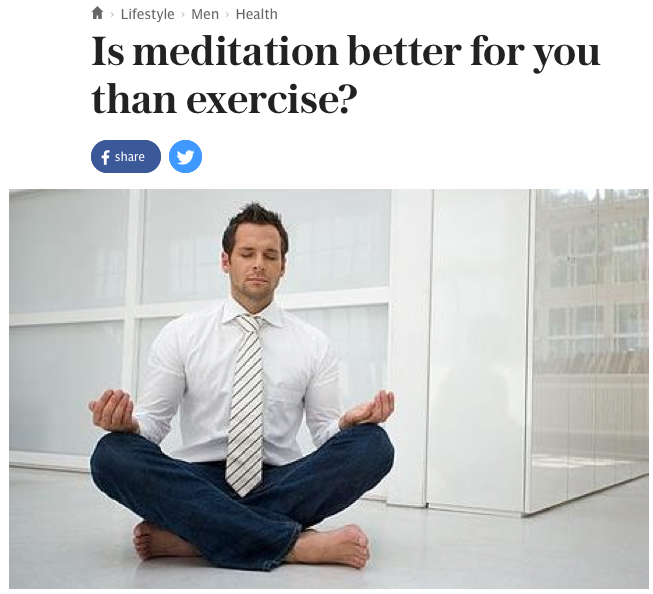 The journalist also refers to earlier studies, linking meditation to a stronger immune system, a strengthening of the lungs, and even claiming that meditation may be “stronger than morphine” for pain relief. One interviewee also mentions the effects of meditation on the parasympathetic nervous system, better quality sleep, and even improvement of athletic performance. However, the article also quotes researchers who are less enthusiastic, claiming that “mindfulness meditation programs had moderate evidence of improved anxiety, depression and pain, and low evidence of improved stress/distress and mental health-related quality of life”. Anne Grete Hersoug, an instructor in Acem Meditation and a clinical psychologist at the University of Oslo, also believes in the profound physical effects of meditation – but would not consider it an effective replacement for exercise. “According to scientific studies,” says Hersoug, “Acem Meditation has been found to have a profound physiological effect on the practising individual. It allows the meditator to relax deeply, leaves them feeling more energised and is overall a refreshing experience – much like recharging one’s batteries. However, whilst Hersoug acknowledges the benefits meditation can have on your body, she believes that first and foremost, mindfulness is for the mind. “Most of the physical benefits associated with deep relaxation and mindfulness come as a by-product of soothing mental stress,” Hersoug reveals. “I would not make a comparison between meditation and physical exercise. Meditation cannot replace half an hour of exercise – and it is vastly different from fitness training. Meditation works better than exercise as it doesn’t require any special equipment nor specific place, even giving 5 minutes time for meditation can lead you to a calm state. It’s not harmful nor risky as it’s only a practice, so just need patience and persistence! You can combine meditation with 15min walk everyday to lose some belly fat! I think it depends on what you need. Walking for me is meditative, especially if it is outside around nature. That can bring me more benefits then meditating inside depending on what my body needs. I don’t think it is about better, but meeting different needs. I agree that meditation is good for the mind and body. But if you meditate it’s extremely important to exercise too to help move the energy that builds up as you meditate. Once you feel the energy flowing in your body in meditation, it is deeply healing and healthy for the body. You can actually feel health and goodness radiating through your body. Thanks for sharing this tidbit. To be honest I was quite surprised to read the opinion that meditation may be “stronger than morphine” when it comes to pain relief. There are heaps of evidence that meditation improves stress, combats anxiety and other mental health-ailments. We can even argue that meditation improves the immune system but to say it is stronger than morphine may be overreaching a little.. Very interesting post. I do both: meditation & excercising and love both! Doing it everyday really enhanced my life.